It's normal for food bloggers to come across unfortunate encounters". This is sadly the case with La Barca. I was excited to try this place, since it's located near me, and also because the Chef is heavily advertised for his Michelin Star, which he gained in Italy in 2009 in his restaurant in Siena, Tuscany. I was therefore eager to try his cooking, hoping it would match some of the superb Tuscan cuisine I had on my last trip over there, especially in Siena. I must say the place is quite a hidden find, tucked away in the Goodman Arts Centre. Once you get there, the interior is very pleasantly spacious and elegant. There was a $35 lunch menu which included starter of mozzarella and tomato Caprese, Paccheri with broccoli sauce, and apple tarte as dessert. I didn't chose this option since it was not that compelling, so we both ordered a la carte. 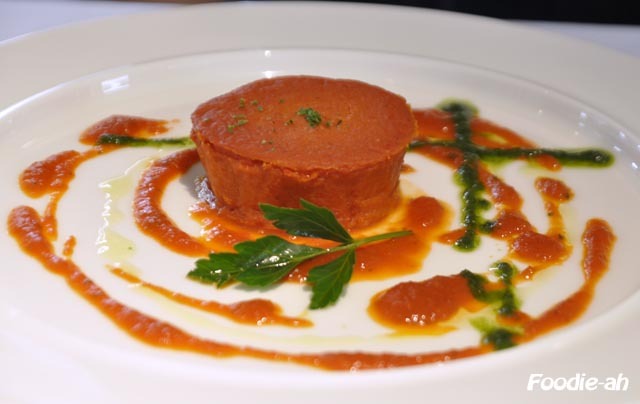 The Roasted Capsicum Flan with Fresh Tomato Sauce was nothing incredibly exciting. The presentation was quite sloppy, and the texture quite stodgy and polenta-like. It did taste of peppers, but I thought overall it was lacking in something. It was basically like eating a pepper-flavoured polenta. This was the best dish of the lunch, and we only went downhill from here. 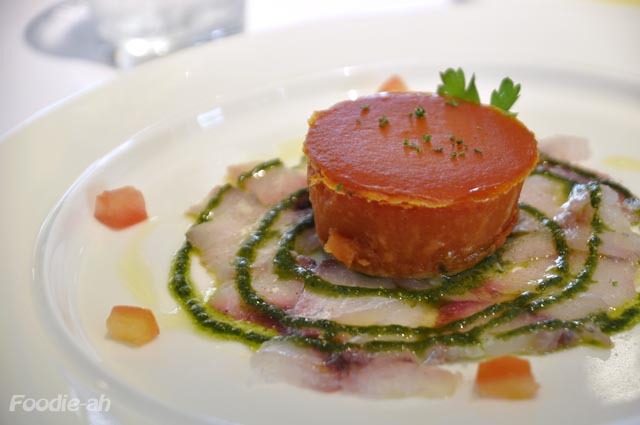 My Raw White Fish Fillet served with a Tomato Flan and Basil Pesto looked so similar to the other starter, that I was initially confused about which one was which, as it looked like both of us ordered the same dish. The two flans looked exactly the same and had the same texture, except mine tasted of tomato. I was puzzled trying to pair the flan with the fish, since they really didn't match. But the most dramatic aspect of this sterter was the fish itself. As I attempted to eat it I could smell it. And even worse, as I ate it, it was mushy and it lacked of taste. There was nothing to "cut" the fishiness of the fillet (such as vinegar, lemon juice or mustard). The condiment was in fact just oil and "basil oil" - yes, the old friend basil oil, back from the 80's. The last time I had seen this old school condiment was when I ate at yet another "unfortunate encounter": Bontá. It's sad that those remote memories re-emerged during the meal. I was still hopeful that my gnocchi would turn out nicely. After all, how can you get wrong something as simple as gnocchi? Now I know the answer to the question. 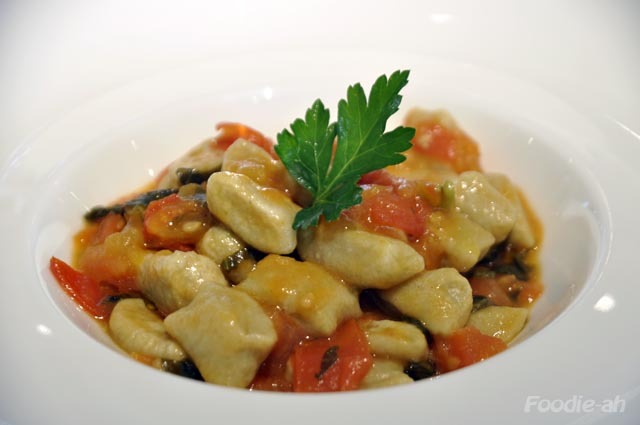 You can screw up the texture of the gnocchi, and of course, the sauce! And in this case I found them both a disappointment. The gnocchi were mushy and had no bite (they were sort of "dead"). Even compared to my own Gnocchi alla salsiccia, draw your own conclusion. And I am not a Michelin star chef. The sauce was basically some local fresh tomatoes, chopped and sauteéd for a few minutes, with a bit of salt. No flavour nor texture whatsoever were identifiable in this dish. I left it and returned it almost intact. 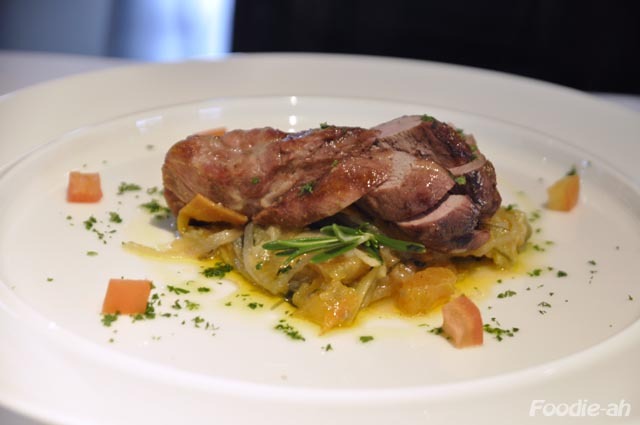 Finally, the meat: Grilled Pork Fillet with Wild Fennel and Vegetables in Tomato Sauce. I thought meat is something a Michelin starred chef should definitely get right. Once again, no flavour, and unpleasant "porky" taste throughout. Basically, although the meat itself was cooked well, it lacked of herbs and seasoning to bring out the flavour. The $123 bill was something to be pretty upset about, thinking that if I had cooked any of these dishes, I would have considered them a miss, and also that I know of a few good Italian restaurants in Singapore where I could eat like a king at the same cost. It's never joyful to feel ripped off. 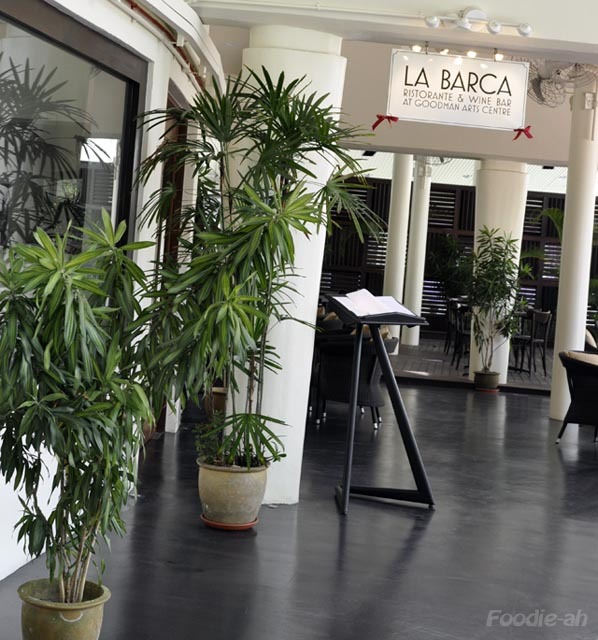 Good luck to "La Barca", but I believe the days that you can get away with expensive, sloppy Italian cooking in Singapore are gone.